The dialer is the familiar TouchWiz app and features all the basics - smart dial, quick dial and even a video call button. The Galaxy Note 4 features auto call rejection - it can reject all calls, only calls from specific numbers, all unknown numbers and so on. Blocking mode is even more restrictive - it blocks incoming calls and silences notifications and alarms. Only contacts on the priority list will be able to get a call or a message through. Blocking mode can be set to turn on and off automatically during a certain time period (e.g. at night). You can create custom vibrations for different callers (similarly to the way it's done on iOS). We had no issues with the Samsung Galaxy Note 4 when it came to reception or call quality. Sounds came out loud and clear in the earpiece and callers on the other end said they hear us without issue. The noise-cancelling microphone on the Samsung Galaxy Note 4 also seems to do a great job of eliminating the cacophony of the outside world. Samsung went with a back-facing single speaker on the Samsung Galaxy Note 4. Given the extra space on the phone we would've preferred stereo speakers anywhere but on the back. At least the quality and loudness of the speaker is up to scratch - it came out with an excellent score and is among the loudest phones we've tested. Things don't stop at loudness though - the sound was clear and of great quality. The Samsung Galaxy Note 4 has two email clients - the Email and Gmail apps. Both are well familiar by now and work just as ever. You can use them side by side via Multi window as well and use the drag and drop functionality for text. The Samsung QWERTY keyboard really shines on the ample, high-res canvas of the Samsung Galaxy Note 4. It features a row of numbers above the letters and a rich set of features. You can enter text by swipe-typing (like Swype and others), as well as move the cursor or view all alternative symbols for a key (which can be great if you use special symbols a lot). Naturally there's Voice input but also handwriting recognition. 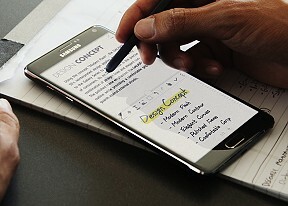 You can type things using S Pen and then the software converts them into better-looking text using a handwritten font.